Sarajevo’s people moved us with their stories of what it was like to grow up in a city under siege. Pavement and buildings permanently scarred from mortar blasts and sniper fire stopped us in our tracks to reflect on the horrors that must have occurred in the very spot we were standing. Yes, modern warfare had taken its toll on this city. But there is so much more to see in Sarajevo than just bullet-ridden buildings. Here are seven must see sights in Sarajevo. 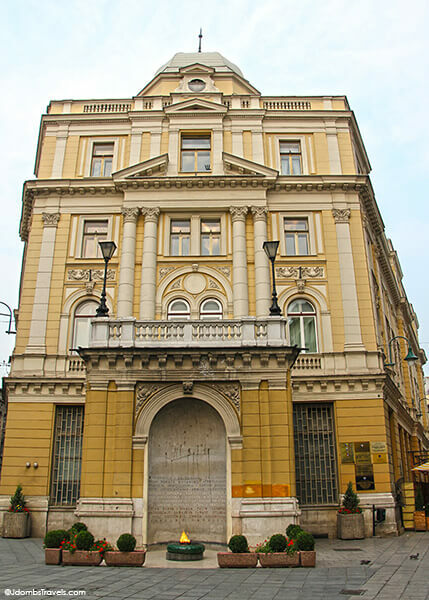 On June 28, 1914 as Archduke Franz Ferdinand and his wife, Sophie, ride in an open car across the Latin Bridge toward the Town Hall, Gavrilo Princip stepped forward and shot and killed them both. This assassination at the Latin Bridge immediately started WWI. Fast forward to WWII, the Eternal Flame commemorates the sacrifices made and lives lost. It was dedicated on April 6, 1946 and can be found at the end of Sarajevo’s pedestrian street Ferhadija. Very early on January 2, 2011 the flame suddenly self-extinguished before a crowd of revelers. A passing tourist heroically re-ignited the flame less than 20 seconds later to the relief of the crowd, preserving the memorial’s continuity. The Baščaršija is a great place to start off a visit to Sarajevo. Wandering Sarajevo’s Coppersmith Street might leave you thinking you’re in Istanbul as the sounds of craftman’s hammers on silver and the smells of Turkish coffee waft through the air. Stroll the Turkish bazaars (and barter for some hand-knitted wool sweaters), indulge on the Bosnian food at the cafes, and people watch. The mosque was badly damaged in the siege of the city by more than hundred mortar-shells hits. It has since been restored and while we did not go inside as I was not appropriately dressed with the temperatures nearing 100 F, I was thoroughly fascinated to hear the call to prayer multiple times of the day. People would come, remove their shoes, and kneel on carpets in the courtyard to pray. Sarajevans are proud to point out that they have four religions and their places of worship residing on the same block. Completed in 1889, the cathedral was badly damaged in the siege of the city and restored. The design above the cathedral’s door is part of the flag and seal of Sarajevo Canton and the Romanesque towers are featured on the flag and coat of arms of Sarajevo. 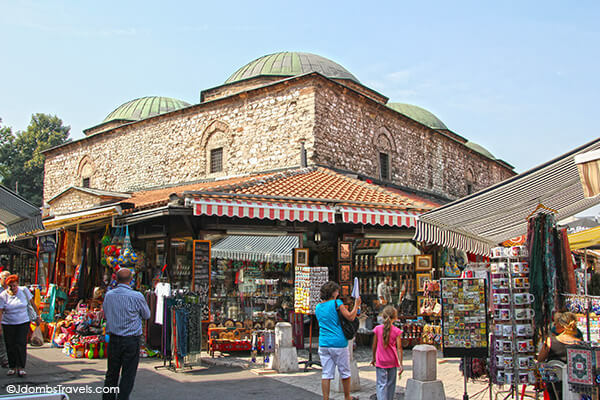 The Emperor’s Mosque was the first mosque to be built after the Ottoman conquest. It was built in 1457 and dedicated to to the Sultan, Muhammad al-Fatih, the conqueror of Constantinople. 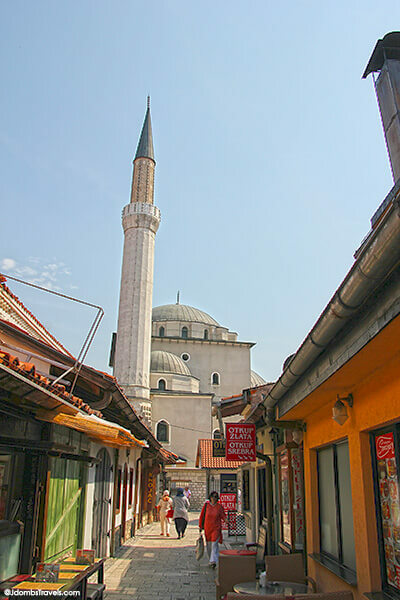 The first settlements in Sarajevo were built around the mosque and a bridge was built across the Miljacka River leading right to the mosque. That bridge was disassembled during the Austro-Hungarian rule and rebuilt just a few meters up river. We live just an hour away from Padua, Italy where Saint Anthony himself is buried. And yet, here we were in Sarajevo, Bosnia standing in front of the Franciscan Church of Saint Anthony of Padua. On accident. We came across the church on our walk to the Sarajevska Pivara, Sarajevo’s brewery, for dinner. The church was built in 1914 to serve the local Catholic community. Sarajevo wouldn’t have been high on my list of places I wanted to visit, but it looks beautiful. The history must be fascinating. We went for probably the stupidest reason ever. We love this music group called the Trans-Siberian Orchestra (they’re rock opera) and our favorite song is called Christmas Eve in Sarajevo. It’s been a long running joke that we would spend some Christmas Eve in Sarajevo. We obviously didn’t go for Christmas Eve, but had no expectations what-so-ever when we arrived. And the city ended up knocking our socks off. I’d actually really love to go back at Christmas time and see the city decorated. Very interesting article and look into the Bosnian culture. Thanks for this post. My secretary was a tri- lingual Bosnian refugee from Sarajevo. She was granted political asylum in the United States during the Civil War. What a tragedy. She married a Chinese refugee. 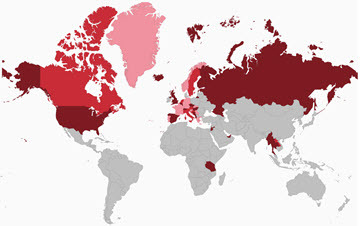 Bosnia and China's losses from ethnic hatred were the United States' gain. Thanks for sharing that story, Suzanne. One of the most interesting parts of our visit to Sarajevo was talking with people that had lived through the Siege.